Sony kicked off the 2017 Tokyo Game Show with its press conference on September 19, taking its time in limelight to highlight some of the PlayStation 4 and PSVR titles we can expect over the next year. Like E3 2017, much of Sony’s press conference was taken up by trailers for games old and new, with familiar footage from titles such as Call of Duty: WWII, Red Dead Redemption 2 and the upcoming Shadow of the Colossus remake. Admittedly, Tokyo Game Show isn’t known for show-stopping announcements; Sony primarily uses it to focus on titles and announcements that will be of interest and sometimes exclusively applicable to audiences in Japanese and Asian territories. However, there is the occasional announcement that will excite PlayStation fans the world over. We’ve rounded up those announcements from this year right here for you. Probably the most exciting announcement for everyone is that Monster Hunter: World finally has a release date. The game will be released across the world on both PS4 and Xbox One on January 26 2018. There’s no word yet on the PC version of the game, though the game will be coming to the platform. 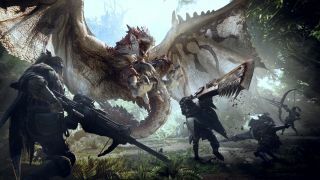 Capcom and Sony also announced that there would be a special Liolaeus Edition PS4 Pro, embellished with Monster Hunter: World art. This console will be released in Japan on December 7 but unfortunately we don't yet know if it'll see a release in the west. Final Fantasy is having something of a renaissance off the back of the excellent Final Fantasy XV. The latest title in the franchise arriving on PlayStation 4 is Final Fantasy IX, a port of the PlayStation original. The original game was first released in 2000 (can you believe it? ), and was revealed to be live on the PlayStation Store by Square Enix during the show. The port appears to be similar to the PC and smartphone re-release from 2015. The game can be downloaded now from PlayStation Stores worldwide and will be sold at a discounted price for PlayStation Plus members until September 26. Square Enix also took some time at the show to announce it’s releasing a brand new game for PlayStation 4 called Left Alive. The game is being developed by some exciting names: Metal Gear’s Yoji Shinkawa is working on character design while Shinji Hashimoto, of Final Fantasy and Kingdom Hearts fame, is producing. The director of the Armored Core series, Toshifumi Nabeshima, is on team and Takayuki Yanase, mech designer on Ghost in the Shell: Arise, Mobile Suit Gundam 00, and Xenoblade Chronicles X is also part of the process. It’s hard to tell from the trailer or the announcement what exactly the game will involve but it looks to have a post-apocalyptic setting when it arrives in 2018. Sony always makes time for PlayStation VR at its shows and this time it announced some exciting new titles are coming to the platform. The first is a VR version of Konami’s Zone of the Enders, which was originally released for PS2 back in 2001. Coming in Spring 2018, Konami promises the game will have enhanced graphics, support for 4K resolution, and brand new sound design. There will also apparently be brand new features in the game but there was no more detail given about what these will be. Another PSVR announcement in a very different vein is that mobile game Neko Atsume is coming to PSVR. For those who somehow managed to miss the Neko Atsume phenomenon, the surprisingly addictive game essentially involved players collecting and feeding cats and not too much else. We have nothing other than a title image and a 2018 release date to go on but suffice it to say we think a more immersive version of this already perplexingly addictive game has the potential to be life-consuming for existing fans.